In early 1867, Joseph Levy gravitated from New York to Galveston. The eldest of nine brothers and sisters from the French province of Alsace, the young immigrant saw his future in the only major port west of the Mississippi, a fast developing Texas, a recovering South and a very definite potential for economic growth. He began to send for members of his family and the first to arrive was his brother Ben. The brothers, each with a keen eye for horses, went into the new business known as J. Levy and Bro. in 1868. Its sole function was to buy and sell horses. With the growing and prospering livestock trading business established, the brothers expanded by renting and selling sturdy buggies, elegant carriages and also boarding horses. Once the business was on a secure financial footing both brothers married. Joseph sent for his childhood sweetheart, Carolyne who lived in Germany and Ben married Flora Schram, a Galveston girl. The Levy evolution from trades of horses and mules to the caring of the dead was a very gradual process. Prior to the advent of the funeral home, the disposition of the dead was handled entirely by the deceased’s family. A carpenter was contacted for the construction of a simple wooden casket, the minister arranged for, and a plot secured in the local cemetery; if one owned a buggy or a buckboard, transportation to the graveyard was one less problem to worry about. Those who did not own such made arrangements with a local livery. 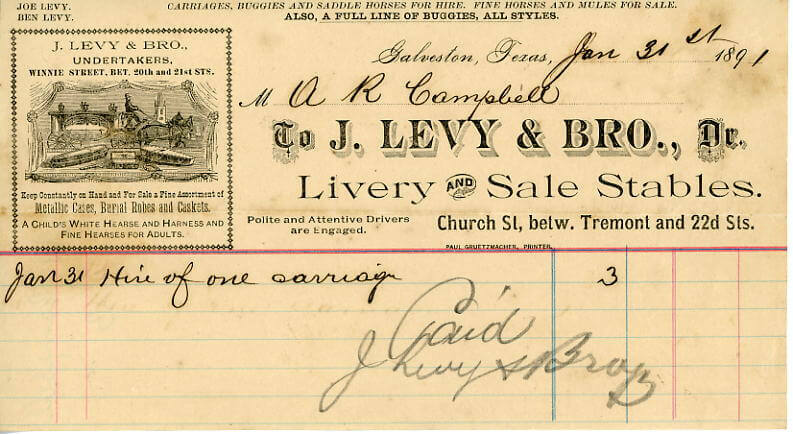 The Levy brothers seemed the likely place to turn to, and, as Galveston grew, they saw an increasing need for funeral transportation and purchased an exquisite horse-drawn hearse and other carriages. The citizens of Galveston came to depend upon the brothers for the handling of their needs during these times and the sympathy and understanding exhibited by the brothers only served to intensify the dependence. By the end of the century, J. Levy & Bro. Had come to meet the social changes of the times, and the major portion of the business had become undertaking – undertaking the preparations pertaining to the burial of the dead that had once been handled entirely by the bereaved family. The business did well until 1908 when Ben Levy died. Soon after his brother’s death, Joseph retired; but what looked like the end was simply a changing of the guard. Sam J. Levy, the eldest son of Joseph and Jack M. Levy, the eldest son of Ben, took over the enterprise and saw to expansion and modernization. These two cousins saw the end of horse trading, moved out of the livery business, and added an ambulance service to J. Levy and Bro. By 1915 the importance of the funeral business dominated all other business interested held by the Levys. 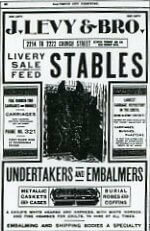 In 1916 the first motorized hearses were purchased, yet it was the better part of two years later before the last of the horse-drawn hearses was retired. In 1920 Jack sold his interest in the business to Sam. By 1926 the business had completed its evolution and had become a complete funeral home and was located on the corner of 22nd and Broadway. An automobile accident took the life of Sam Levy on September 12, 1930, but his widow, the former Aline Lion, and his son, 23-year-old Joe, continued to operate the business. As owner and manager, mother and son formed a partnership. In 1965 Joe was approached with an offer to sell the funeral home to a holding company. Without hesitation he turned down the offer saying that a Levy would continue in control of the almost 100 year old institution. On April 30, 1969, some one hundred and one year after his grandfather established the business J. Levy and Bro. was sold. Joe remained an officer until 1974. Over the years J. Levy & Bro. 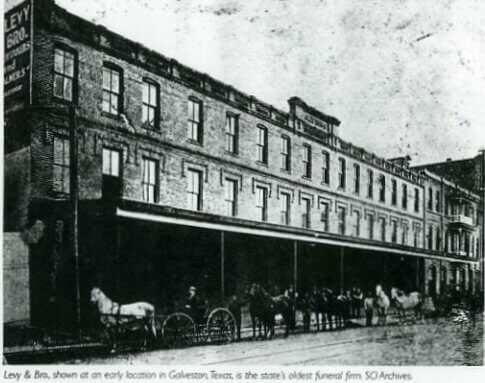 has meant more to the history of Galveston than just being a long-standing funeral establishment. A part of the community, J. 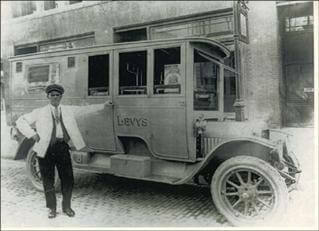 Levy & Bro Funeral Home has served generation after generation of Galveston families during their most trying time. In 2001, native Galvestonians D. J. and Jill Russo Termini purchased J. Levy & Bro. Funeral Home. A strong desire to better serve Galveston and Galveston County prompted the Termini family to proudly continue the Levy bother’s legacy to provide quality and affordable funeral services and begin a new tradition in the celebration of life. In 2006 the Termini's renewed their commitment to service by adding their own name after their predecessor’s name. J. Levy & Termini Funeral Home continues the nearly 140 years tradition begun by Joseph and Benjamin Levy, caring for the Galveston community and its families.